15 Signs you’re Over analyzing and How to Stop it? A common aspect in many individuals mostly female is that they tend to over analyze every aspect of their life. Things would be so much simpler if you could just go with the flow and embrace everything that comes your way. 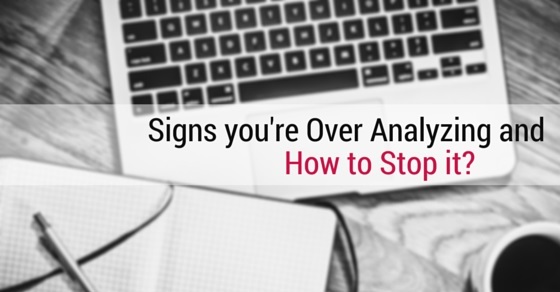 Here are some sure signs that you too are an over analyzer along with some helpful tips to help you stop these over analyzing. The following mentioned are few tips on how to stop thinking too much and avoiding this overthinking disorder. One of the surest signs pointing to the fact that you are an over thinker is that you spend a lot of your time immersed in thought and that is the reason why you hardly ever get much work done. Thinking and planning ahead is a good thing but you should not keep indulging in daydream through the day such that it actually affects your work! You should keep trying to convince yourself to actually get down to business without thinking of various possibilities which might or might not occur. Proceeding on hypothesis is a flaw that many of us are guilty of. By doing this individual tend to make every situation in their life much more complex than it ever needs to be. Once you concoct too many hypothetical situations in our mind, over a period we start believing these falsehoods to be a reality. We cannot distinguish between illusion and reality. One great way to help you overcome over analyzing things is seeking professional help so that they can direct you accordingly. None of us are soothsayers and no one knows what the future has in store for us, Problems have a knack of suddenly making an appearance at times when we least expect it. As human beings all we can do is live each day to the fullest, make each moment count and place our trust in God, hoping that he will guide and protect us. Faith is something that really helps sooth the nerves of people rather than fretting about things. The future is a mystery to us all and worrying about it does not solve any problems. If you end up focusing entirely on the future you might miss out on all the great things that are happening in your life today. You as an over thinker must realize that once you do your best you should let events take their natural course. No good comes from overthinking anxiety and it eventually does lead to much bigger health issues like stress, blood pressure as well as heart disease. It is in the nature of over analyzer to never accept anything as it is. They always try to dig just a bit deeper and contemplate just a little more to ensure that they have taken into consideration every facet of the problem and that there is no stone which they have left unturned when it comes to a peculiar situation. However sometimes when a person says something you should realize that he or she has no ulterior motive, there is nothing more to the story and maybe you should leave it at that! The trait of over-analyzing is like an obsessive-compulsive disorder of sorts, but pertaining to the mind. Even if the smallest of chance occurrence take place they try and read deep into it and excavate a hidden meaning. These traits make it very difficult for individuals to be friends which such people. However, this is a habit that ought to be handled delicately so that the individual does not go on to feel isolated. A sure sign that you are an over thinker is that you take even the smallest of things very seriously; even a joke cracked by an individual is something which you end up taking to heart. It is okay to be serious in life, however it is important to realize that all friends joke and they hardly ever mean what they say, you must try to be mature enough not to be so over sensitive when it comes to light-hearted comments, otherwise over time people might choose to stop communicating with you at all. At no point in your life should you keep quiet if you think that you ought to raise your voice however it is also important to make sure that you do not end up blowing even the smallest of things out of proportion, much to the irritation of people around. So if you are an over thinker then what you should try to do is differentiate major issues from small ones and do not concentrate on the things that do not matter much. Doing this will really help you react as per the situation at hand. Owing to the fact that you have so much going on in your mind you often end up missing out on things that are actually going on in the present moment. If someone tells you half a story you make an assumption about the second half without having any particular facts. When you assume things all you end up doing is letting your mind play tricks on you. A great tip that help you stop doing this is paying attention to what people are saying and not letting your mind go out of control, coming up with assumptions. Even if you are out with friends you end up forcing yourself to think about some event in the distant future which may or may not even happen at all. People that keep overthinking things in their mind always end up spoiling their own mood and giving themselves a headache! So it is better to stop overthinking. A great thing to do is trying to focus on the positives that might come out of a situation rather than thinking of the negatives. Doing this is a great tip indeed to sooth the nerves of overthinkers. Sometimes it might just happen that for some reason or another, people turn down a plan to grab a meal or even say no when you ask a favor of them. If you are someone that takes such rejection personally then you are certainly an over-thinker. Stop thinking too much about such things, it will just waste your time rather it is better to understand the compulsion of the person. People who over analyze rarely ever see the positives and more often focus on the wrongs and negatives. Such an attitude makes the individual very critical not only about himself or herself but about the world in general. It has been often noticed that cynical people are too tough to work with and owing to their attitudes people dislike being friends with them. Of the surest signs that you are one to over analyze a situation is if you constantly fret about even the tiniest of things. You take great pains to ensure that you do not let even the tiniest of this pass. Rather than letting something go and feeling liberated, you prefer to harp on it. Letting things go is something that does not come easily to all, but if you gradually learn the art of it, over time you will feel free and alive with no heavy burden on your shoulders. Owing to the fact that you try and weigh and measure the pros and cons of any decision that comes your way, you never act impulsively at all. Though taking risks blindly is something that is incredibly dangerous, yet taking calculated risks is not always a bad thing. One of the most common signs of an over analyzer is that he or she is almost always glued to their cell phones, bbm-ing, whatsapping or texting their close friends and updating them about ever incident in their life, big or small. They constantly seek council from their friends on every decision which they have to take. Overthinking or over analyzing is a kind of disorder which unfortunately many of us possess. People having this disorder usually think too much about few situations and also the outcomes that is linked it. All this is done in order to base your self-assurance and understanding. In this type, people do not get rest if they do not analyze the whole situation by replaying it over and over. The situation can be of any type, whether family, health or any other related thing. The main outcome you finally get with this disorder would be exhaustion, stress and waste of time. Avoiding all this will feel you more balanced in such situations and experience inner peace. Here are few things to avoid overanalyzing if you truly want to be happy. Experts believe that “Excess of anything turns out bad“. In the similar way, thinking is good but overthinking is definitely not a good thing. The outcomes that come with it will inturn endanger him and lead to frustration, anxiety and also illness. They have a tendency to make the simplest thing into tough one. Worrying too much about everything is the main cause of over thinking. The end result of being such overthinker would lead to become a chronic over-thinker. Follow the below-mentioned tips to manage overthinking ness. What people who over analyze don’t realize is that often their friends might get bored of their constant indecision and may start growing bored of their constant obsessing over the smallest of things. These are some of the sheer shot signs that you are an over thinker who frets about even the smallest of things without having any concrete issues to worry about. Letting go of this bad habit is something that does not come easy, however over time you should just keep telling yourself that worry and over analyzing is no way by which an unexpected problem can be avoided so it is always best to live in the present.